Philadelphia Police are investigating after a shooting involving two taxi cab drivers outside of Frankford Transportation Center in broad daylight Saturday afternoon. 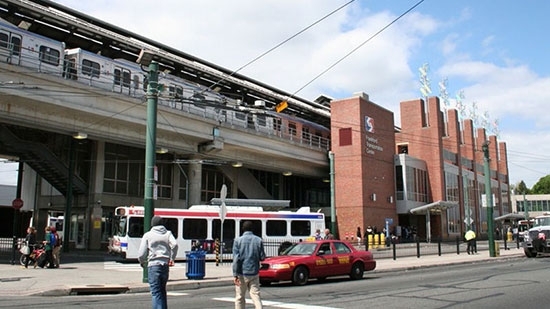 It happened around 2 p.m. at SEPTA's Frankford Station on the 5200 block of Frankford Ave in Northeast Philadelphia. Two drivers got into an argument over a fare and an altercation broke out. One cab driver pulled out a knife and the other taxi driver pulled out a gun. The one driver then shot three times, hitting the other driver in the head, neck, and stomach. SEPTA police arrested the shooter. The victim was taken to Aria-Torresdale Hospital. The driver with the gun has a permit to carry. Authorities in Montgomery County are looking for a driver who left the scene after a 2-year-old was struck Saturday afternoon. The hit-and-run happened just before 5:00 p.m. at Spring Garden and Bannockburn Avenue in Ambler. The boy was playing in Knights Park and ran out into the street. He was hit by a dark gray Toyota 4Runner or other SUV which continued southbound on North Main Street. The boy was flown to Children's Hospital of Pennsylvania with serious but non life-threatening injuries. The NBA announced the 14 finalists for the Naismith Memorial Basketball Hall of Fame Class of 2017. The list includes legendary Villanova head coach Rollie Massimino, who led the Wildcats to the NCAA National Championship in 1985. The 82-year-old has had a long coaching career amassing 800 wins. He was on the Main Line from 1973-1992. Right now he coaches at NAIA Keiser University in FL. Also, included for the first time is former 76er Chris Webber. Webber was known as a member of the "Fab Five" at Michigan during his college days. He played for 15 years for 5 different franchises in the NBA, was a 5 time All Star, and averaged 20.7 points and 9.8 rebounds per game. He played in Philly from 2005-07. Other first time finalists include: NBA referee Hugh Evans, Connecticut women’s star Rebecca Lobo, two-time NBA scoring champion Tracy McGrady, five-time All-Star Sidney Moncrief, Baylor women’s coach Kim Mulkey, Kansas coach Bill Self, and two-time NBA champion coach Rudy Tomjanovich. Returning finalists: star point guard and Olympic gold medalist Tim Hardaway, winningest all-time boys high school coach Robert Hughes, Notre Dame women’s coach Muffet McGraw, former Wisconsin coach and four-time Division III national champion Bo Ryan and 10-time AAU women’s national champion team Wayland Baptist University. The inductees will be announced on April 3rd at the Final Four.